Claremont-Nedlands celebrates successive One Day League triumphs. 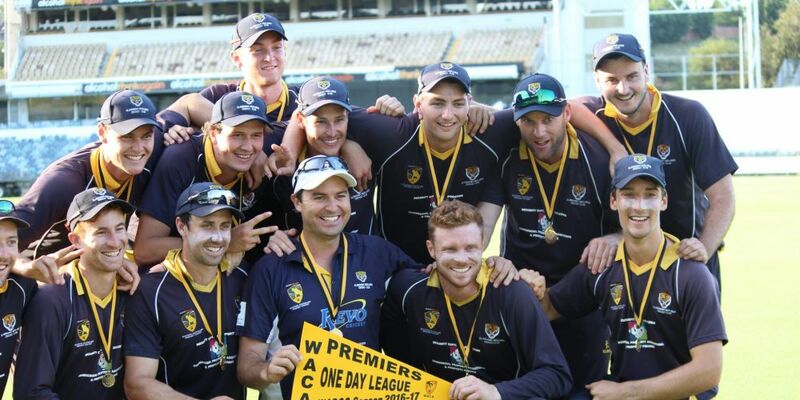 CLAREMONT-Nedlands has clinched the One-Day League premiership for the second consecutive year after a dominant victory over Fremantle at the WACA on Sunday. Travis Birt was the difference, blasting 149 from 122 balls to lead the Tigers to 304, before the Tigers’ quick bowlers ripped through the Fremantle top order to complete a resounding 169-run win. Tim David was outstanding with the ball, capturing 4-33, before the returning Joel Paris and Matt Kelly ensured the club went back-to-back for the first time in its history. An eight-wicket win has seen Subiaco Floreat jump into fifth position at the end of the regular season, with Wanneroo no match for the finals-bound side at Kingsway Sports Ground. A five-wicket haul from Andrew Holder was the difference, with the quick establishing himself as this year’s premier fast bowler. Ash Blake chimed in with three wickets as the Roos were all out for 125. That total was never enough, with wicketkeeper Callum How finding some form with 73 from 78, while 36 from Anthony Murphy kept his confidence high going into sudden death next weekend. University finished its season on a high by belting Rockingham-Mandurah at James Oval, with the seven-wicket win a consolation victory between two struggling sides. The Students bowlers restricted the Mariners brilliantly, with David Moody impressive with 3-25, while Sean Stuart spun his way to three wickets, as the visitors were bowled out for 140. Max Hope (70 not out) and Josh Mason (43) guided the Students home in response, with a 115-run stand ending any chance of a Mariners upset. The Tigers were equally as impressive on Saturday, taking down South Perth at Cresswell Oval by 100 runs. The Tigers struggled for consistent partnerships when setting their total, however Tim David (53) and Chris Brabazon (39) steadied the ship for the host side. A late 39 from Brad Hope pushed the side to 226 from their 50 overs. Haydan Morton secured three wickets as the Sky Blues were bowled out for 126.